At the moment, AT&T is the only US mobile carrier that's offering a Windows 10 handset (the Microsoft Lumia 950). But this should change soon, as T-Mobile is - as previously rumored - getting ready to launch the Alcatel OneTouch Fierce XL. According to Windows Central, the OneTouch Fierce XL will become T-Mobile's first Windows 10 smartphone, though it's not clear exactly when the device will be launched. An Android-powered version of the Alcatel OneTouch Fierce XL is already available in the US via MetroPCS, which is asking just $69 (off contract, after rebates) for it. We don't know if the Windows 10 variant of the handset will be this cheap, but we're pretty sure that it's not going to be expensive anyway, since the two versions of the device should have similar specs. Like the Android-based OneTouch Fierce XL, the Windows 10 model will likely sport a 5.5-inch display with 720 x 1280 pixels, being powered by a quad-core Qualcomm Snapdragon 210 processor. Moreover, the new handset is expected to have LTE connectivity, an 8 MP rear camera, 2 MP front-facing camera, 2 GB of RAM, and 16 GB of expandable internal memory. Although the render seen above suggests that the Alcatel OneTouch Fierce XL comes with Windows Hello (Microsoft's biometric-authentication technology), Windows Central reports that this feature is actually not on board. 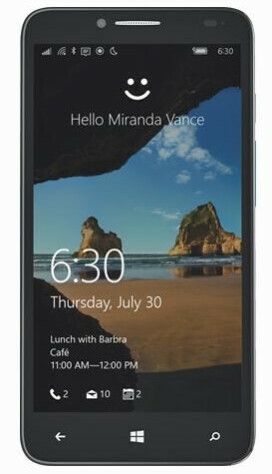 Microsoft is a trend of under powered smartphones. Not sure if 210 is enough but why not 410! so what more do u expect from a 70 dollar smartphone. well we have moto e 2nd gen for instance or moto g 2013 . add 30 dollars and you aim at 2nd gen moto g 2nd gen . there should be other phones too. I think that's Microsoft that sets the bar in low end market with under powered cpu's in lumias like 435 535 . actually it makes sense if one wants to penetrate that dirty cheap phone market. 210 on Windows mobile is on par with 410 on Android. This phone is not made by Microsoft, its simply running Windows 10 mobile. What you are saying is akin to saying that Microsoft makes those pathetic under-powered low end dell desktops. They don't, Dell does. Alcatel makes this phone, not Microsoft. Save for the display size, this phone has the same, or lower, specs as the L640 which goes for about $50. Not to mention the Lumias have a few more features and the best cameras of any non-flagship device - Windows or otherwise.